The Model 1W1000B amplifier is a solid state, self-contained, air-cooled, broadband amplifier designed for applications where instantaneous bandwidth and high gain are required. 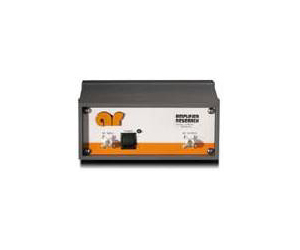 The 1W1000B, when used with an RF sweep generator, will provide a minimum of 1.0 watt of swept power. Housed in a stylish, contemporary enclosure, the Model 1W1000B provides readily available RF power for typical applications such as RF susceptibility testing, antenna and component testing, watt meter calibration and as a driver for frequency multipliers and high power amplifiers.